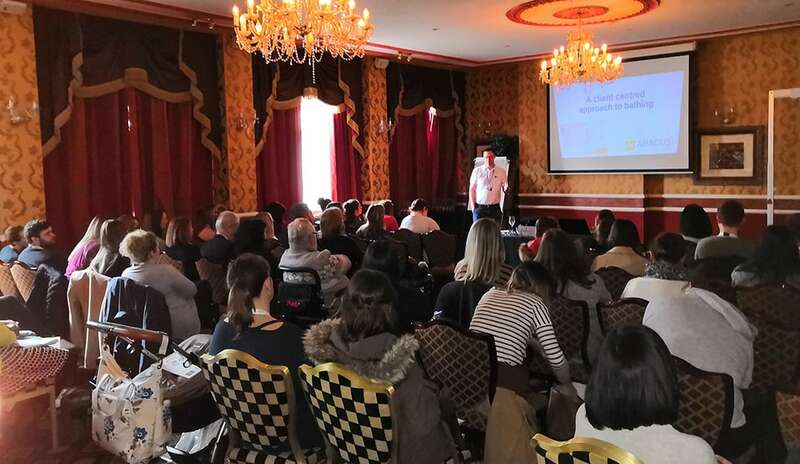 A bathing seminar presented by Adam Ferry, Occupational Therapist (OT), in association with Abacus Specialist Bathroom Solutions, received high attendance at the recent Occupational Therapy Adaptation Conference (OTAC) in Chester. OTAC events provide vital information for healthcare professionals regarding housing adaptations and specialist assistive equipment. In addition to displays from product manufacturers, these conferences include an educational programme and CPD-accredited training. Delegates, including OTs, attending Chester were able to gain invaluable information and advice during the seminars, particularly with the Abacus ‘A client-centred approach to Bathing’ presentation. Adam, from The OT Service, is integral to the Abacus ‘Lunch and Learn’ and ‘CPD Assisted Bathing Workshops,’ which provide free training nationwide for carers, OTs and moving and handling specialists. This latest seminar generated significant interest with the seminar room full of delegates. It highlighted clinical and legislative evidence to support bath justification during the DFG process. According to the company, feedback was positive from attendees and, subsequently, many requested client assessment visits from the specialist Abacus team. The Abacus representatives at OTAC were also able to demonstrate the new Gemini 2000 bath – the bathroom specialist’s largest and longest powered platform bath with variable height. It provides future-proofed bathing for children and adults, as well as incorporating pioneering BioCote antimicrobial technology. This invisible infection-controlling solution cannot be wiped or worn away – hence providing 99.9 percent 24/7 protection against harmful microbes such as Influenza H1N1, E.coli, Salmonella and antibiotic resistant MRSA. Abacus will be presenting its next OT-led assisted bathing seminar at Kidz in the Middle, which takes place at the Ricoh Arena in Coventry on 21st March 2019.